Out of curiosity, what did you make those charts with? I agree completely with Mark, and I’m glad he posted before me. People are chatting back and forth on twitter, they’re spamming every song they play in itunes to it, etc. It’s blogging vs microblogging, and I think a much better comparison would be number of active users, rather than number of messages. why are you comparing blogger and twitter? why not AOL dialup subscribers? it’s equally non sequitar. The charts are straight out of Excel. The apples vs. oranges comment is valid, but I still think it’s a useful comparison, more useful than the AOL Chat comparison. Twitter isn’t strictly IM on the web. Yes, lots of people are using it in that way, but it’s not a chat room. There’s a significant publishing aspect. Plus, when Blogger launched, it was just a textarea and a post button, just like Twitter. And if you look back at early Blogger use, there’s a surprising amount of “chat” back and forth between users…for many, it was a distributed chat room like Twitter or MySpace is today. What are your thoughts on Tumblr? I use both Twitter and Tumblr (but not Blogger) and am curious to where you see Tumblr fitting in between straight-up micro blogging (Twitter) and more traditional means (Blogger). More specifically, how these systems affect our communications and the topics we discuss. Just a thought. And one other point. If circa-1999 Blogger had offered hosted blogs right away (a la blog*spot) and not via FTP and had built-in Six Degrees type of stuff from the beginning, it would have essentially been Twitter. Twitter is what 1999 Blogger was in an alternate universe. This is like comparing volume of text messages to emails. If you remove spam from the equation, there’s certainly going to be more text messages sent in a day than emails. My dad only recently learned the difference between my e-mail address and my website address. He doesn’t even know how to check his voicemail on his cell phone, much less send a text message. Twitter seems like more of a niche thing than blogging. (Although it’s fair to say that blogging was once, and maybe still is, a niche thing.) I don’t see it ever catching on in the mainstream. It’s uses seem a lot more limited than blogging. I like Tumblr. One of my biggest frustrations with MT and Wordpress and almost every other blogging tool out there is that they don’t offer multiple post types. Tumblr does. Where I think it still has a way to go is on the reading/exploring side. In the context of the above post, Tumblr is a Blogger-type application because it doesn’t have any of the social stuff built in. Make it easy for people to build reading lists and social ties and expose them on their Tumblr blogs. Increased utility and growth will follow. Twitter is halfway between IM and blogs, and the number of posts reflect that. I’m surprised it keeps pace with Blogger even at the start. To me, that indicates slower growth. Did you think about maybe at least using anecdotal evidence to scale the graphs? It seems to me that, with the obvious exception of you, the average blog get an average of somewhere between .5 and 2 posts per day. Meanwhile the average twitter user seems to send between 3 and 10 messages per day. Again I don’t have hard numbers, this is anecdotal, but it’s also undeniable. So what, in your view, does this graph actually mean? To me, without scaling for the point above (which has been echoed about 10 times above), there’s no clear meaning to this graph. 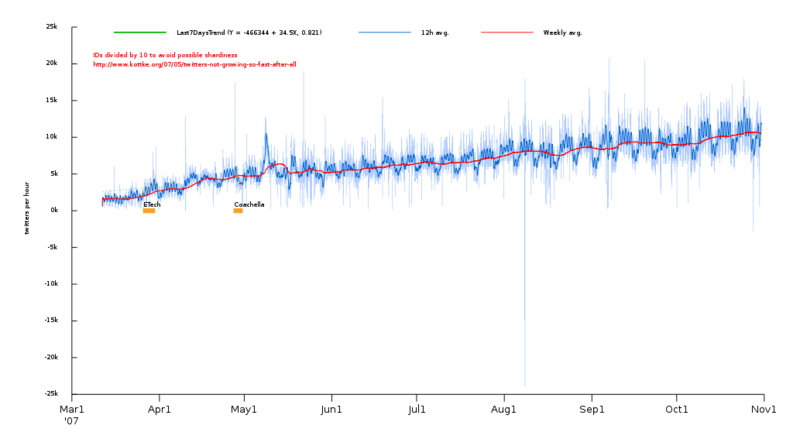 It’s just you saying “I got all this neat data and look when I graph it… look!!! DATA!!!! !” Don’t get me long, I totally empamathize with your love for data, I just like to be able to draw meaning from it too. This is really interesting, Jason. You’re asking more than one question here. 1. Is Twitter taking off faster than Blogger did? 2. Why has Twitter been so successful in such a short period of time? I’m not sure the first question will ever get a satisfying answer because you can’t really compare apples to apples. Contexts are different, the technologies are different, and there is no consensus about how to measure “speed of taking off.” I like what you have done but tracking number of messages doesn’t strike me as telling the whole story. One thing you don’t mention is that Twitter messages (tweets) have a constraint on their length of 140 characters. It might take me five tweets to say what I could in a single blog post. As for the second—from a personal standpoint, I love that Twitter makes the write page and the read page one page. This makes it into a conversation in a way that a blog is not. The best comparison I can think of for this feature is the Facebook wall. As for tumblr, they are introducing social stuff. I haven’t checked it out yet, though. Agree completely about Tumblr lacking, at the moment, on the reading/exploring side. I’ve “friended” a few people on Tumblr and their content shows up in the same place/timeline where my own content does and it can get sort of confusing sometimes. Also, I have yet to associate logging into Tumblr with checking out the Dashboard page for the content my friends put there. Instead, for now, it’s more of a WP-like dashboard…where I start in terms of content production. With all that said, I’m looking forward very much so to see how Tumblr solves/tackles the lack of comments. They said they have something tricky up their sleeves differentiating from traditional comment systems. Ultimately, if Blogger and Twitter use the same increment value for their messages, your graphs are dead on. If not, the Twitter curve should flatten out a good bit, shouldn’t it? what happened in november 2006? a conference i assume? agree with @mike newman. while all your points about the 7 year difference, social aspect, etc are very INTERESTING, I don’t think they explain the data as much as the 140 char limit. Just look how @spin uses twitter. He basically disaggregates his blog posts out over 10 tweets or more. the tweet-to-blog-post ratio might be the biggest driver of the difference in posts. the other factors you cited are still important, but my guess is they are secondary. feel like running a regression? I’d add another consideration. Because of the ease of publishing, the posts to twitter are very impulsive. Less thought is required. You think it; you tweet it. It’s like comparing a book to a blog. I can’t publish a print book every day, but I’ll blog about my imaginary cat in a heartbeat. There’s very little “social” to this. It’s just harder to blog that to tweet. and this is why i tweet, this is why I tweet. this is why, this is why, this is why I tweet. for got to link the I tweet cause I tweet which was a post in response to a danah boyd question. I go into more detail about the value of the system, especially as a micro-blogging platform. I’m down with Baratunde Thurston’s comment, though I’d put it another way. Comparing quantity of messages without reference to quality or content of messages is the problem. It certainly appears to be a proxy measure for popularity or adoption. But it’s a qualitatively different medium, masquerading as a similar one. I mean, your post here counts as 1. Interesting parallel to volume measures in the finance world. The highest volume contract in derivatives world is the Kospi 200 Options, on the Korea Exchange - it’s volume is 2.4 billion contracts annually, versus 240 million contracts for futures on the US treasury bond. Ever heard of the Kospi 200? I’m hoping for a better measure, JK, of centrality or significance, or importance. Volume isn’t capturing it for me, here. Comparing Twitter messages to blogger posts is unfair, simply because it ignores all the comments. PArt of blogging is the back-and-forth of commenting. With Twitter, its all messages. I’d like to see a graph of the number of words sent through twitter vs Blogger (including comments), not the number of messages. If anybody has the time, resources, and energy, I’d like to see a similar graph showing Number of User Sign Ups (thousands) against Days Since Inception. I tend to agree with the apples-to-oranges comparison argument that a few commenters have made: you can blast 20 tweets in the time it takes to edit/proof read a blog post (at least in my case). The metric that would be really interesting to publish - but I guess that Ev is the only one who could do it - is the comparative growth of Blogger users vs. Twitter registered users. And even that will be skewed by the fact that Twitter is very natural to adopt for bloggers who have no time on their hands to seriously post, but can still twitter when they have 30 seconds of downtime. Your data is not correct, let me show you. 3) modify this to be -1 of the current twit ID, you get the lost files kitty. 4)TWITTER ID’s ARE INCREMENTED BY 10!!!!!!!! I agree with everyone about the validity of the comparison that you’re making here. I’d say that it’s akin to comparing the number of hand-written letters to the number of e-mails sent in a day, but that’s not quite correct either. The numbers are definitely interesting — it would be awesome of you posted the raw data so that other people could play around with the scaling (maybe even by a crude average words per post for the two services). To me, it looks like Blogger’s growth is driven more by an increase in the number of users while Twittr’s spike looks like a dramatic change in usage patterns. My guess is that the curve goes exponential once users started seeing the value in posting multiple status updates per day. Perhaps this was re-enforced by the explosion of back-and-forth commenting around SXSW? I know that my account sat fallow for months until it started to be adopted by more friends; I suspect that this is what happened for a lot of early adopting nonusers, too. Thanks for the great data. I’m concerned that the novelty of Twitter will wear off sometime later this year and its use will peak. We’ll see what happens. i kinda of agree that it’s apples and oranges, like comparing the consumption rates of headlines versus articles in a newspaper or magazine. twitter messages do convey information and sometimes meanings, but they rarely convey anything deeper than that. i’d like to think that both forms co-exist, but are understood to be very different kinds of information experiences. i must admit one thing at this point - i’ve been reading kottke.org for almost 6 months now, sometimes checking it a few times a day. to me most of your blog entries are headlines, which i often find incredibly valuable and fascinating. i have observed myself really enjoying your one sentence point of view on things following a link post. however, this twitter vs. blogger entry sums up what i’ve been hungry for from this blog since day 1 - a saliently articulated set of points-of-view. now i’m not saying that you should long-post all the time, i am saying that in reality people consume information in bite-sized chunks (snacks) but also tend to enjoy thoughtfully developed pieces (meals). i consume both, and now that kottke.org is more than a daily trip to the bodega counter loading up on sugar and carbs, and a nice place to sit down and enjoy an exquisitely prepared meal, i think i’ll stay awhile. there may be 2 ways to interpret the twitter data - 1) the world has been craving more and more information snacks (however trivial, and twitter messages excel in this) and balance is being restored in the universe, or 2) A.D.D. is a natural stage in evolution for humans, and not to be considered a disorder at all, but a characteristic of our species. please do indulge the reading, dining audience with more of your thoughtful and written insights. the ideas are certainly there in that smart head of yours, and these ideas are highly satisfying to consume, not unlike a meal at french laundry (and what kind of wine do you recommend with this blog post?) thanks for listening, i am a fanboy. I’m shutting down this thread because the above post is mostly incorrect due to bad Twitter data. Please read the updates at the top of this post…Twitter is not nearly as popular as Andy’s and my analysis would indicate. More soon.